The 3M� DBI-SALA� Tape Measure Retractor Holster is designed to be used with the Tape Measure Sleeve. Together, these products allow tape measures to be quickly tethered and holstered. A retractor feeds through the back of the holster and can be connected to a D-ring on a 3M� DBI-SALA� Tape Measure Sleeve. D-rings on both sides of the holster allow for an alternative means of tethering the Tape Measure Sleeve. A rear-feed retractor attaches to your tool and extends up to 52 in. (132.1 cm) providing dropped objects tool protection and automatically retracts staying out of the workers way. 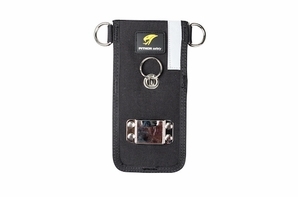 Allows tap measures to be safely tethered and holstered for dropped objects protection.